I seem to be in the mood for pencil skirts lately. I don’t quite understand my draw to them right now since they’re not ideal daily wear for someone who currently spends most of their time sitting on the floor reading books and playing blocks with toddlers. Maybe it’s my subconscious mind’s way of telling me that I could stand to spend more time with adults?! 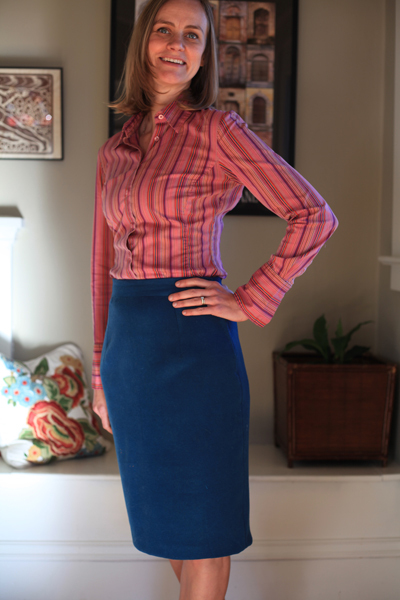 This particular pencil skirt is the BurdaStyle Jenny basic skirt with a shortened waist and an added kick pleat, and it’s made using one of Mood Fabric’s double-faced wools. The wool is thick and spongy and would make a beautiful unlined coat since being double-faced means it’s equally gorgeous on both sides. 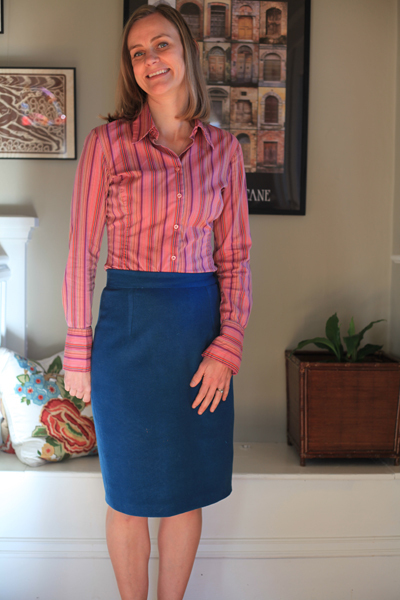 But, with only a yard and with pencil skirts on the brain, a skirt it was! 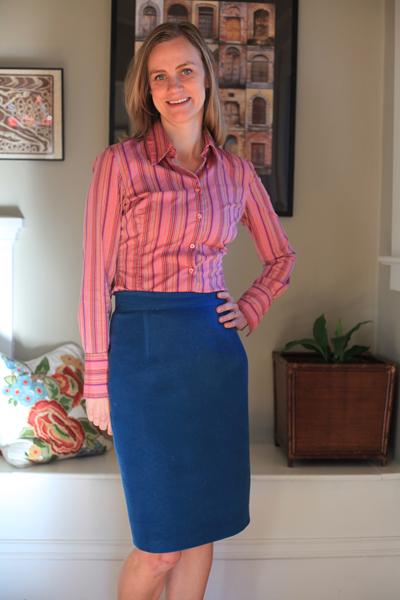 It was lovely to cut and sew – a nice, well-behaved fabric with no slippery edges and no crazy patterns to match. The thickness of the fabric made it easy to hide the hand-picked zipper and hem stitches. I didn’t even have to go through the entire fabric to feel like I had a secure hold. But, the thickness also made it a pain to press. I used a press cloth that I’d made out of a large square of silk organza so that the iron would come in as little contact with the wool as possible. I also tried to hover the iron over the wool and take advantage of my iron’s steam function as much as I could. Even still, where there were multiple layers of the thick fabric – at the seams, darts, and hem, all of which I’m also in the habit of making sure are nice and pressed while sewing – the fabric still picked up a bit of that shine wool can get from the iron. If it weren’t for this small amount of shine, I bet the hem would be completely invisible! Next time I’ll try to be even more careful with how I press a nice wool like this one. 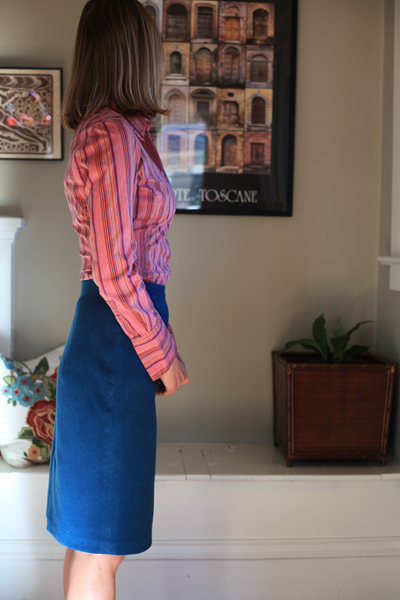 Though this wool is one of the softest I’ve ever used, I still lined the skirt with one of Mood’s silk crepe de chines. I always figure a skirt like this deserves that extra something that a lining provides. Have you ever worked with a double-faced wool? What did you make? Any good tips on how to get a good press? Snow Day (Faux) Fur Coat!